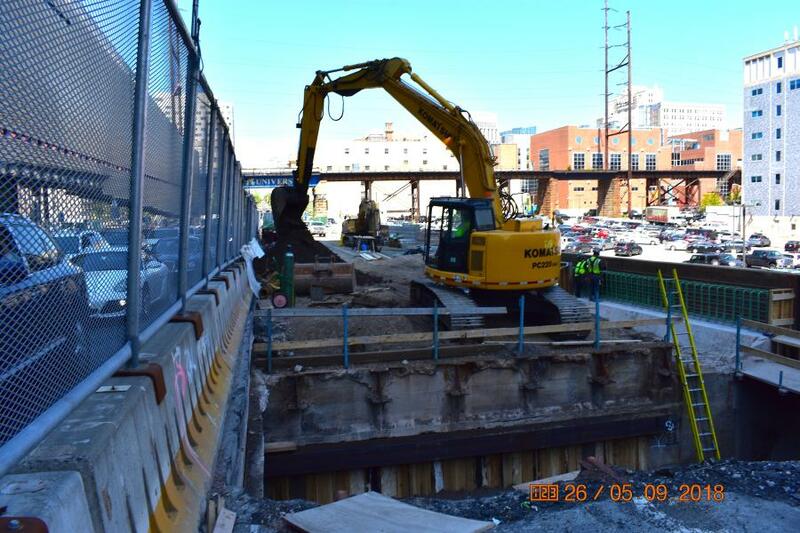 As part of its commitment to bridge preservation, the Pennsylvania Department of Transportation (PennDOT) is rehabilitating the Chestnut Street bridge over the Schuylkill River, connecting Center City Philadelphia with University City and West Philadelphia. 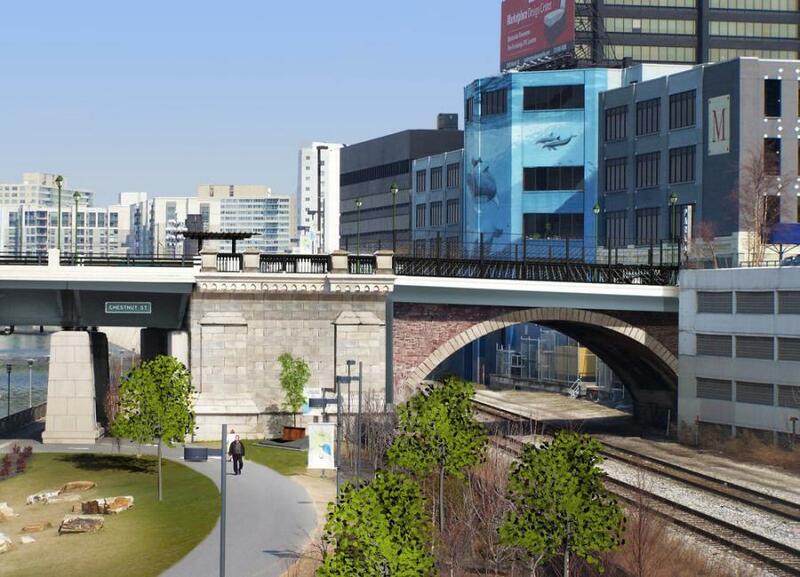 The $103 million project also will replace the decks of three adjacent Chestnut Street bridges, two viaducts on Schuylkill Avenue and two ramp structures for I-76, as well as resurface and install bicycle facilities on Chestnut Street between 31st Street and 22nd Street. The work is financed with 80 percent federal and 20 percent state funds. Buckley & Company Inc. is the project's contractor, with Alfred Benesch & Company overseeing design engineering and Johnson Mirmiran and Thompson (JMT) serving as construction manager. Bridges on Chestnut Street and Schuylkill Avenue West will be under construction concurrently and will remain open for most of the project. There will be various travel lane and sidewalk restrictions on I-76, Schuylkill Avenue West and Chestnut Street during the three stages of work that will require shifts in the lane and sidewalk configurations. The on-and off-ramps will be restricted to single lanes during construction. There will be nighttime and weekend full closures of the ramps during certain construction operations. Windisch said the biggest challenges include performing construction activities in a constrained urban environment within the project limits of a major metropolitan city, including one-way and two-way traffic. Congested streets maintained by PennDOT and the city of Philadelphia Streets Department come into play, with the project in close proximity to underground subway transit systems. Dealing with daily morning and afternoon peak rush hours impacted by the construction work zones can be difficult, with detours and traffic control measures also having to be addressed. Phasing of bridge structure rehabilitation construction activities within small, predefined, secure construction work zones (protected by temporary concrete barriers and fencing) presents a challenge, but provides a protected construction work zone to the many skilled tradesmen performing work activities while keeping motorists, cyclists and pedestrians from entering into harm's way. Bridge structure rehabilitation work related to active passenger and freight railroads also presents a scheduling and logistics challenge, as working in and around railroad right-of-way property requires protective services of safety flagman be provided by the railroads to ensure safety protection is provided to the contractor's work crews from approaching trains. Another challenge is the delicate balance of the contractor working day and night shifts to complete work during off-peak hours, yet keeping noise levels from construction equipment and demolition work activities within city noise ordinance regulations at night, due to many sensitive receptors living in high-rise condominium and apartment buildings within the project limits. Currently, work is taking place to prepare placement of the new reinforced concrete bridge decks on SAW-South and SAW-North viaducts that are located over the I-76 Expressway. This work is sequenced as stages 1A and 1B. Granite masonry restoration work of the Chestnut Street arch structures over 24th Street and CSXT Railroad is under way, as temporary arch support bracing systems have been installed. Chestnut Street is being reconstructed in half-widths at the eastern and western ends of the project. 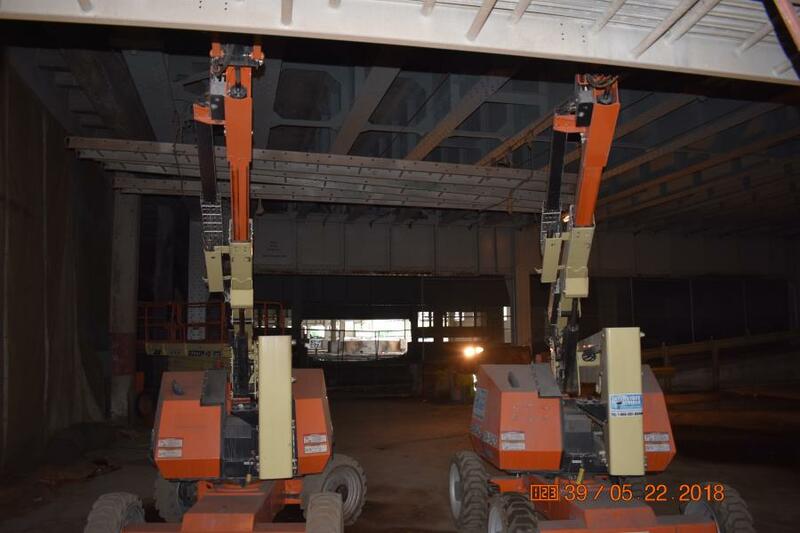 The deteriorated steel girders and beams on the viaduct structure over the I-76 Schuylkill Expressway have been replaced and/or rehabilitated, along with abrasive blast cleaning and priming of the steel superstructure of SAW-South, which is substantially finished. The demolition of the existing south sidewalk of Chestnut Street from 24th Street to 23rd Street, including backfill with flowable fill materials of the existing void areas designated for remediation, has been completed. The new retaining wall and moment slab and storm water utilities on the north side of Chestnut Street between 31st and 30th Street intersections is virtually finished. Weather-related incidents, including rain, snow and extended hot and cold weather events have not had a significant impact to the construction project to date. Blast cleaning and prime painting of structural steel bridge components progressed successfully through the first full winter season 2017/2018 of the project. Extended periods of high humidity and elevated dew point levels during the summer months typically can impact bridge painting operations and are monitored for contract specification compliance by PennDOT's onsite construction inspection staff. The rehabilitation of the Chestnut Street Bridge over the river has yet to be performed, and is scheduled to be carried out in stage two of the construction project over a one-year duration, beginning in June 2019. The full reconstruction of the bridge decks for the two viaducts over the I-76 Schuylkill Expressway has yet to be fully completed, but is in various stages of construction. New street lighting, traffic signals, navigational lighting, trees, ITS components, railings, banners, planters and trellis structure components will be placed along Chestnut Street within the project limits, as well as final bituminous pavement materials when Chestnut Street roadway is paved during stage three in 2020. Prior to construction, the site setting was an extremely urban, rather impervious-surfaced condition with asphalt and concrete sidewalks, roadways, viaducts, off and on-ramp bridge decks, etc., all located within the construction project limits. Along the eastern side of the river is a greenway area and asphalt paved recreational trail where the Schuylkill River Trail is located and is owned and maintained by the city of Philadelphia Parks & Recreation Department. Because of the setting, there's very little area available for staging of construction equipment and materials. Excavation work, due to the tight physical constraints of the project, has required the contractor to use temporary support of excavation methods, such as timber and lagging excavation support systems and stackable trench shields on narrow and deep open excavations for various utilities being constructed. Excavation work is performed in close coordination with the construction sequencing and traffic control plans for the various stages of construction, so that there is minimal disruption to the motoring public. Often, excavation in active roadways is scheduled at night or off-peak times to mitigate disruption. The amount of soil material moved on the project is approximately 8,400 cu. yds. of various types of excavation and approximately 20,500 tons of off-site disposal of non-hazardous waste, regulated fill materials and residual waste. Per project special provision specifications, all in-situ materials excavated on the project were designated for off-site disposal and could not be re-used as normal construction backfill or surplus materials in other areas of the project. Heavy machinery being used on the job includes front-end loaders; excavators; rubber-tired cranes; tri-axial dump trucks; small boom lifting trucks; attenuating shadow trucks; concrete demolition and saw-cutting equipment; portable generators; compressors; and various specialty abrasive blast-cleaning and painting equipment. Materials required include fabricated structural steel members, such as girders, beams, diaphragms, gusset repair plates, etc. used in the replacement of deteriorated steel members of the various bridge structures being rehabilitated. A three-part paint coating system, including primer, intermediate and finish paint coats is applied to blast-cleaned structural steel members in designated superstructures of the various bridges being rehabilitated. Typical construction materials, such as ready-mix concrete & flowable fills, epoxy-coated rebar and bituminous asphalt materials, will be used throughout the construction project. New expansion joint and dam materials are fabricated to replace those on the bridge and ramp structures being rehabilitated. Windisch said the most time-consuming part of the work has been coordinating the various entities involved with the construction project during the design and construction phases, including the two railroads and utility companies. When performing bridge rehab work, especially on such a large scale, there are more than a few concerns. “Discovering unforeseen additional structural deterioration to critical components and associated repairs of the bridge structures being rehabilitated, beyond the contract scope of work, is always a possibility during demolition work being performed during bridge rehabilitation and reconstruction work,” said Windisch. As part of the ongoing work, a new concrete retaining wall was placed along the north side of Chestnut Street between 31st and 30th streets. “This new reinforced concrete retaining wall was constructed integrally with a new reinforced concrete moment slab,” said Windisch. “It was designed to provide resistance to wall overturning due to the forces of inadvertent collision impact from traffic traveling eastbound on Chestnut Street, in the event a vehicle left the travel lane of the highway and jumped the concrete curb and sidewalk adjacent to the retaining wall and moment slab. 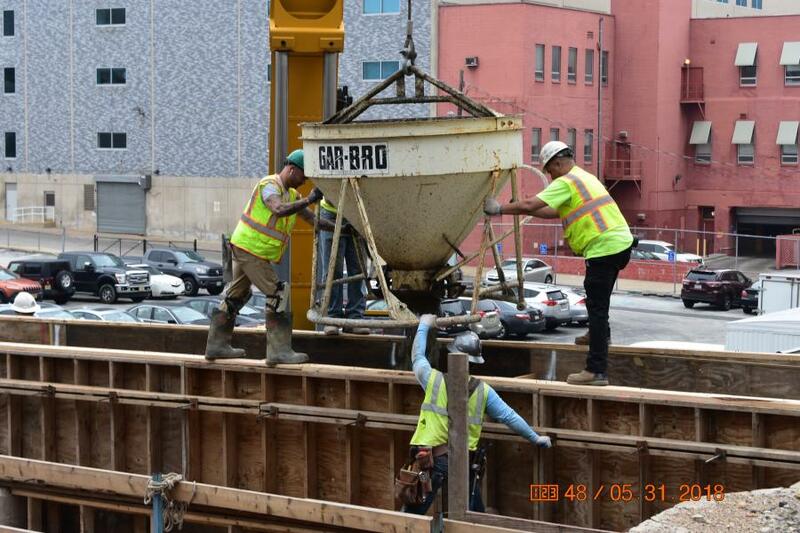 Rehabilitating, repairing and repainting the steel superstructure of the Chestnut Street (Route 3) bridge over the Schuylkill River is a well-thought out process. The bridge will be closed to motorists, pedestrians and bicyclists, and a one-year duration detour will be implemented. Containment/debris shielding will be installed underneath the steel superstructure of the bridge, and demolition of the reinforced concrete deck, sidewalks and parapet will be performed via saw, cutting out and removing small, manageable sized pieces of existing concrete deck to expose underlying steel supports beams and girders. Steel members will be replaced with new fabricated steel members, where deterioration, corrosion and sectional loss has been identified, while other steel members not identified for full replacement will be repaired with additional gusset plates, angles and steel shapes bolted to existing steel members. Abrasive blast-cleaning and dust collection will be performed within an enclosed environment in the containment area to existing steel members to receive a new three-part paint coating system, and prime coating of steel mating surfaces will be performed, along with prime painting of designated steel superstructure members. New stay-in-place galvanized steel pan (forms) will be welded to the top flanges of the steel beams and girders, steel studs will be welded on top of the beams, fabricated expansion joints will be installed at designated locations, epoxy-coated rebar and formwork will be erected in preparation for a new cast-in-place concrete bridge deck to be placed, while intermediate and finish paint coats will be applied to the structural steel members. In addition, sidewalks, bridge parapets, railings, pilasters, lighting, ornamental and decorative components will be installed as per the project contract plans and specifications. 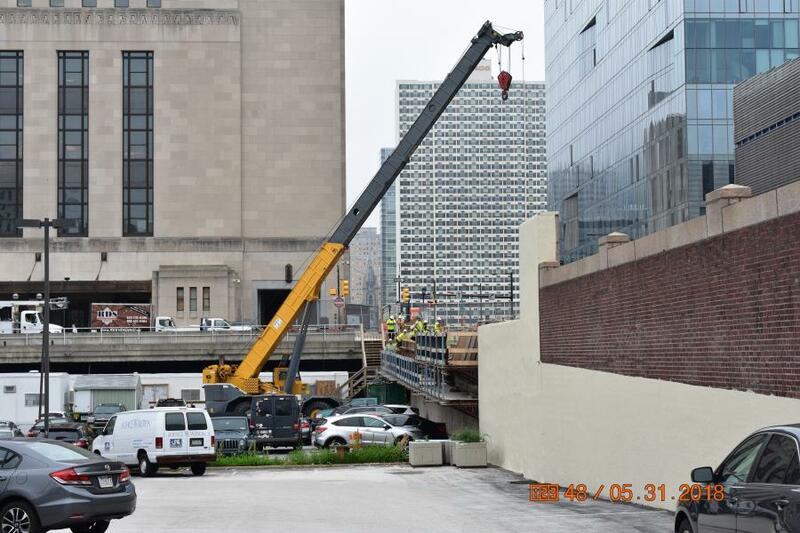 Replacing the deck of the river bridge and the adjacent Chestnut Street bridges over 30th Street and Amtrak, the CSX rail lines, and 24th Street and resurfacing Chestnut Street between 31st Street and 22nd Street also is a carefully planned endeavor. “To efficiently perform the demolition of existing bridge structures to be rehabilitated as part of this construction contract, work is performed at off-peak travel times such as overnight time frames by the contractor to maintain the construction schedule, meet project milestones, etc.,” said Windisch. “The prime contractor has chosen to work two shifts per day, both daytime and night-time construction operations during the normal Monday through Friday work week over the first year of the project. The structures on Chestnut Street were constructed between 1864 and 1960 and carry an average of 18,300 vehicles per day. The structures on Schuylkill Avenue West were constructed in the late 1950s, with an average of 8,600 vehicles per day.